These top 15 math games are a fun way to practice math this summer with the students you tutor! The grade levels for these games range from K-8, and for many of them you can adjust the difficulty to fit the student's needs. I love including games in my own tutoring because I think they are a great way to break up the sessions so you aren't doing the same thing for too long. This is especially helpful for the youngsters! 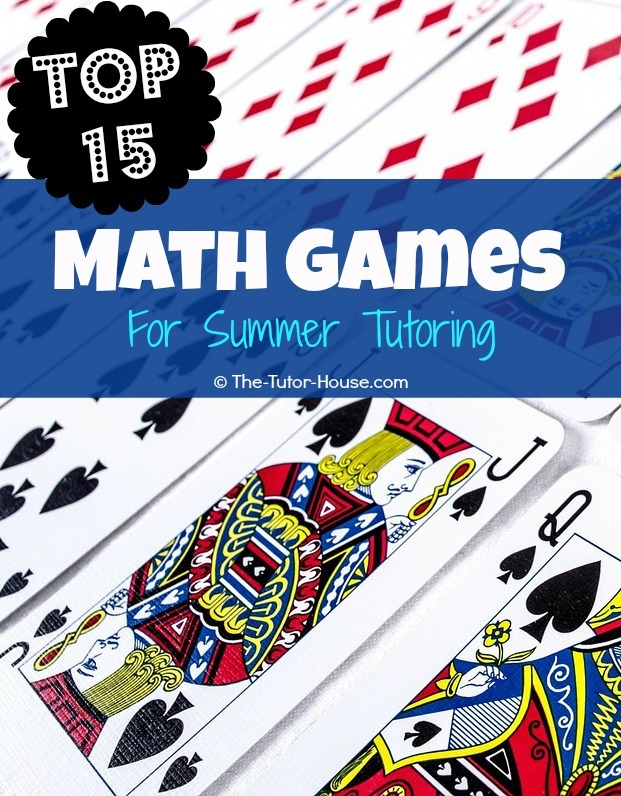 So go ahead and start implementing these top 15 math games in your summer tutoring! I love playing war with cards! You can practice addition, subtraction, multiplication, and just general number sense. I suggest taking out the jacks, queens, and kings, and use the aces as ones. For more advanced playing, put the face cards back in and use them as 11, 12, and 13. To play addition war, players use 2 cards each per turn, and the highest sum wins that round. Keep playing until the whole deck is used. For advanced addition, use 3 or 4 cards at a time. Play the same way with subtraction and multiplication. Want more card games? 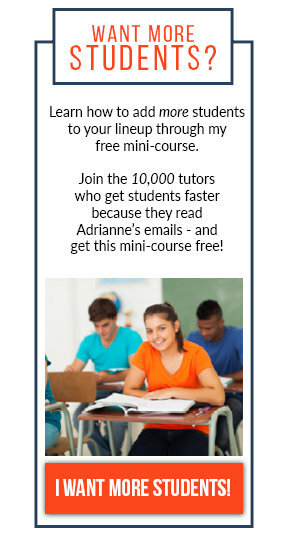 Check out this list or follow The Tutor House's Math with a Deck of Cards! Play a game of go fish by making your own flash cards with the skills you want to practice. You can just write the numbers or problems on index cards – super simple! For example, for an addition game of go fish, player 1 asks player 2 for the answer to 5+6. Player 2 looks at his/her cards for the answer, and if that answer isn't there, says “go fish”! If the answer is there, player 2 gives it to player 1 and that's a match. Player 1 gets to take another turn until there is no match, then it's player 2's turn. Keep playing until all the cards are used. Don't want to make your own cards? Try just using a deck of playing cards. Get students up and moving with this place value stomp game from Creekside Learning. It's pretty easy to set up, and kids will love it. Play a matching game using index cards! For younger students, write numbers 1-20 on two sets of cards. Shuffle them up, place them number side down, and take turns finding a match. If a player finds a match, another turn can be taken. If no match is found, it is the next player's turn. For more advanced learners, do the same simple game but with addition, subtraction, multiplication, division, story problems, or equations to solve. Using dice is a great way to practice math skills. It's definitely more hands on, and kids just love dice! Try playing addition war with dice: both players roll two dice each, and the largest sum wins. Keep track of the scores and see who can reach 50 first. Try it with subtraction and multiplication too! For more games with dice, check out this list. Try this division race game from Relentlessly Fun, Deceptively Educational. All you need is 10 small cars to use. You can download the racing track and playing cards to print out. Using cards or dice, practice showing place values. For example, to show 374, line up 3, 7, and 4 cards in order. See who can make the largest number! Play this strike it out game from Teach Mama. It's a simple game using a number line that provides great practice! Students can get a different learning experience while using technology for math. It also helps to break up the tutoring session, and usually students think of it as a game and not actual work. Check out this list of math apps, and this list of websites to use for great math games! First, do a fun sorting game by putting candy or other manipulatives into different categories. Then, make a graph with Legos! Check out the directions here from Science Sparks. Don't have any candy on hand? Try some of these math manipulatives. Play this fractions card game from What Do We Do All Day. All you need is a deck of cards! Try this no prep fraction game from The Math Maniac. Use counters or pennies along with some paper or a white board with this hands on game. Yes, good old fashioned Monopoly. This game is great because not only does it provide practice for counting and moving around the board, but it provides great practice with money skills in a fun way! 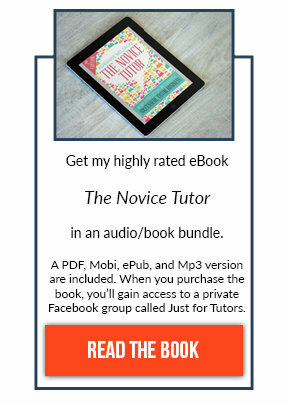 You may not be able to finish a full game in a tutoring session. That's okay, just play a quick version, like owning 5 properties each. Here is a board game from Relentlessly Fun, Deceptively Educational. You can download and print the spinner, cards, and a scorecard.